Slow motion makes literally everything better, plain and simple. From capturing a massive bellyflop, to just watching beer pour into a pint glass, slow motion adds a layer of drama to even the most mundane of activities. Smartphone users have had the luxury of using this technology for some time, and Apple’s latest release of the iPhone 6 and 6 Plus brings with it an updated version of the feature. To access the Slo-Mo mode of your Camera, simply open the camera application on your iPhone 6’s home screen, then swipe twice to the right. You should now see a red record button at the bottom of your phone, and you’ll notice a slightly more zoomed in image than if you were taking a regular picture or video. With Slo-Mo mode activated, press the record button and the video begins recording at the normal speed of a regular video. Once you finish capturing your desired video, just hit the record button again and the recording stops. The finished video saves to your Camera Roll just like any other video or photo, and shows up as a thumbnail in the bottom left corner of the Camera once it’s complete. Once the video logs to your Camera Roll, simply tap the thumbnail in the bottom left corner of the screen to open the editing screen. When the editing screen opens you’ll notice a preview window of your original video and a series of vertical lines above it. The area where the vertical lines have the largest gaps between them is the portion of the sequence currently in slow motion. You have the ability to adjust the length and location of the slow motion portion by just swiping with your fingers. The preview window gives you the option of seeing the finished product before completing the edit. If you like what you see, simply click Done in the upper right corner of the screen and your new video saves to your Camera Roll. 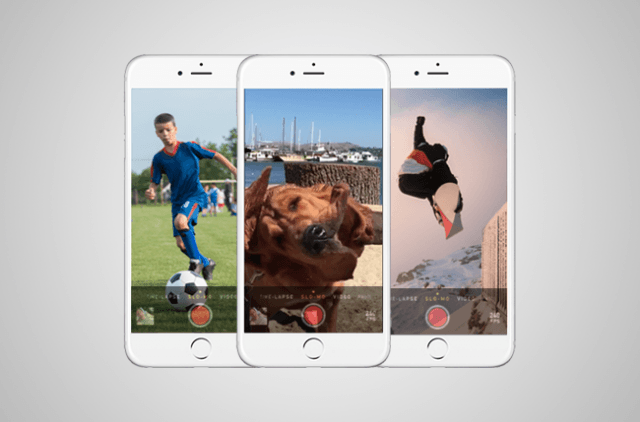 Like any photo or video, you have the option of either sharing it across a wide-range of social media sites, emailing it to friends and family, or sending it out via iMessage. If you simply transfer the video over to a Mac or PC, it will play as a regular video. If you want to export the video in slow motion, use Apple’s free iMovie app to first open the movie, edit it, and then save it as a new video. The new file will retain the slow motion, and can be viewed on your computer as such.